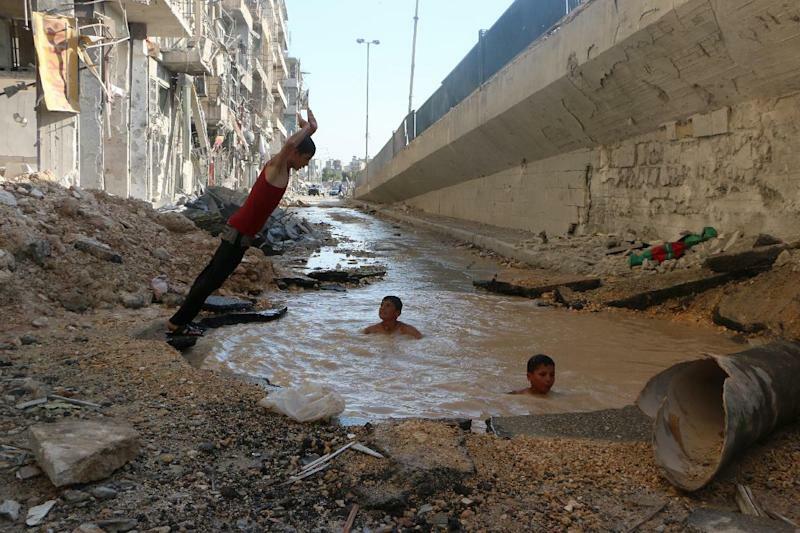 Aleppo (Syria) (AFP) - In Syria's second city Aleppo, craters blasted by regime air raids on opposition-held areas have been transformed into improvised swimming pools for children to cool off in raging summer temperatures. Although the water is filthy, the war-weary children of the country's one-time commercial capital find in these pools a rare opportunity to both have fun and seek relief from the oppressive heat. In the battered district of Shaar, children and teenagers swim carefree in one flooded crater, the rubble of buildings in a totally destroyed street their backdrop, an AFP correspondent said. Despite the visible presence of water in the street, the battered city suffers from endemic water and electricity shortages after being ravaged by two years of war. Young residents have precious few opportunities to relax. "In the past, we used to swim in pools downtown. Now (President Bashar al-) Assad bombards us with explosive barrels and their craters become pools. 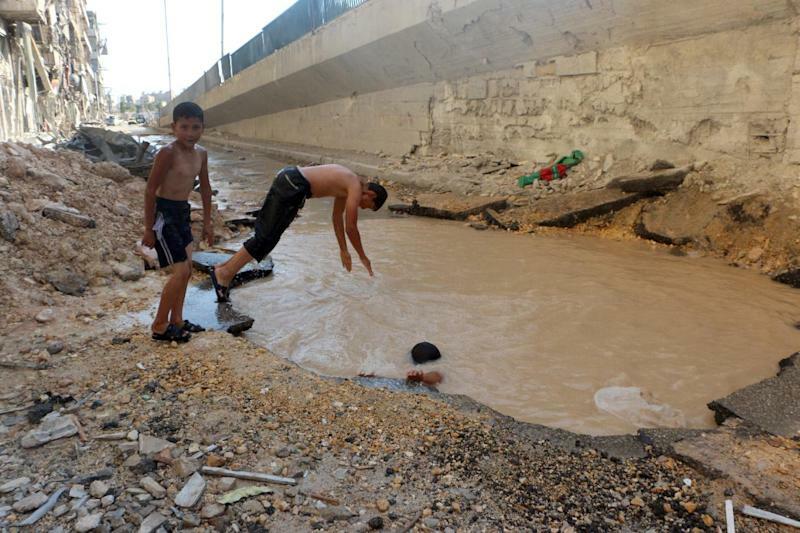 It's very hot and we cannot sleep during the day or at night," said 12-year-old Aleppo resident Abdel Qader. Residents say one huge pool was created when a barrel bomb blasted an underground water main. The water is not at all clean, but teenager Mustafa says he is very happy to be able to swim in it. "There is no water for showering. Sometimes we bring water from here," Mustafa told AFP. "We are tired and fasting," he said, referring to not being able to eat in the daylight hours during the Muslim holy month of Ramadan. An activist in the opposition-held part of the city, Mohammed al-Khatieb, told AFP: "There is water sometimes, but it is in short supply, and there are frequent cuts." Khatieb also blamed shortages in opposition-held areas on regime bombings that damage or destroy key water pumps, as well as electricity shortages which make pumping water impossible. There have also been severe water shortages in the regime-held parts of Aleppo, however. Last week, a priest of the Freres Maristes congregation published an open letter appealing for help for war-ravaged Aleppo, where he said "the situation has become untenable". In his letter, published online, Georges Sabe said: "Since 2 June 2014, an entire city has been deprived of water... The city and its inhabitants, over two million persons, are deprived... deprived of water." Since a major rebel onslaught in July 2012, Aleppo has been divided into rebel-controlled and regime-held areas. For seven months now, as the army has pressed a bid to reclaim opposition-held areas, regime warplanes have launched daily air raids, with more than 2,000 civilians killed and tens of thousands forced to flee their homes. The rebels respond to the massive fire power of loyalist forces with frequent mortar attacks targeting army-held areas. Backed by Lebanon's Shiite Hezbollah, loyalist forces are trying to surround Aleppo and sever rebel supply lines. Rights groups have denounced regime air raids which they say do not discriminate between civilian and rebel targets.